Yesterday I showed a study related to Turnaround Tuesdays. 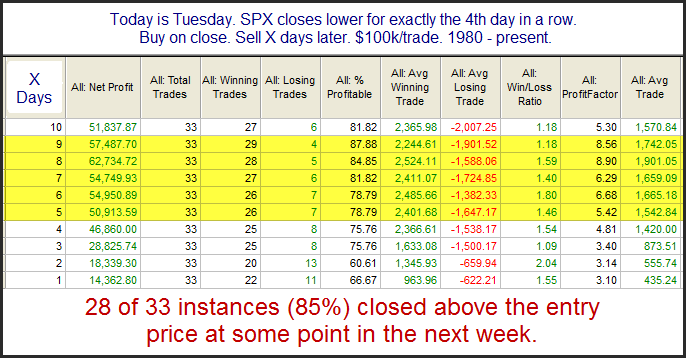 I showed that when the market makes 3 down days going in to Tuesday there has been a decided upside edge. Well, that edge certainly did not play out Tuesday. So what happens when Turnaround Tuesday fails to ignite a turnaround? I went back to 1980 for this test to get a good number of instances. This suggests Tuesday’s failure to turn around simply appears to be a delay rather than a bad omen. Wednesday the market posted an inside day. I haven't discussed inside days in a while. For those unfamiliar an inside day is simply a day that makes a lower high and a higher low than the day before. Over the last decade, when the market has been trading below the 200ma, inside days have suggested negative short-term implications. Below is a table that demonstrates this. Of course there are other nuances and filters that could be applied that could increase or decrease this edge. But generally there has been a poor track record following inside days. It's been fairly steady, too. This can be seen in the equity curve below which uses a 2-day holding period. Instances are a little low but they sure offer some compelling evidence for the bull case. Unfortunately, it looks like the market is going to open today well below yesterday's close. 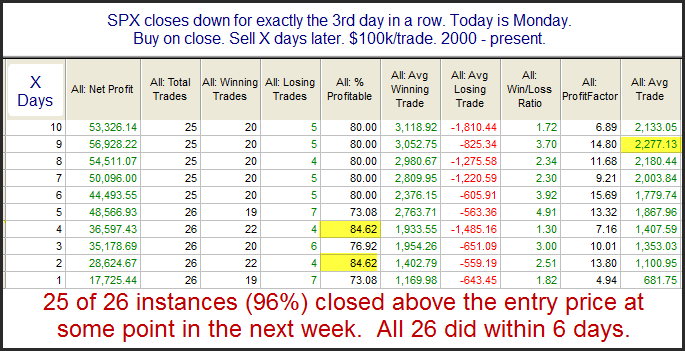 Of the instances listed above there were only two that gapped down the next day. They were the most recent two instances. This puts us in somewhat uncharted territory. Each we hit a new high lately it happens on very low volume. As we saw last week, this is generally a bad sign - at least in the short term. 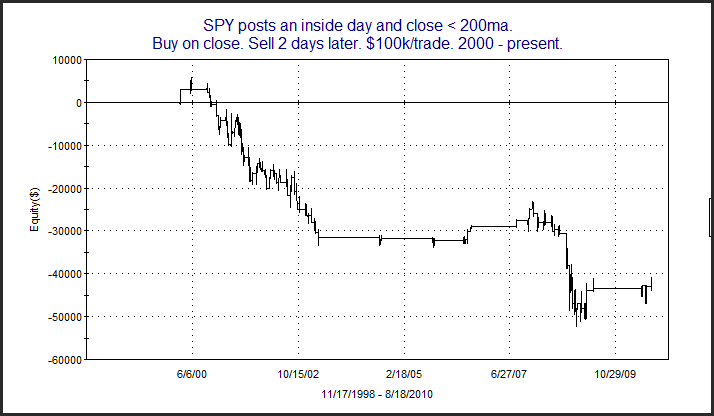 Here's another study from the 8/14/09 blog that triggered Monday. 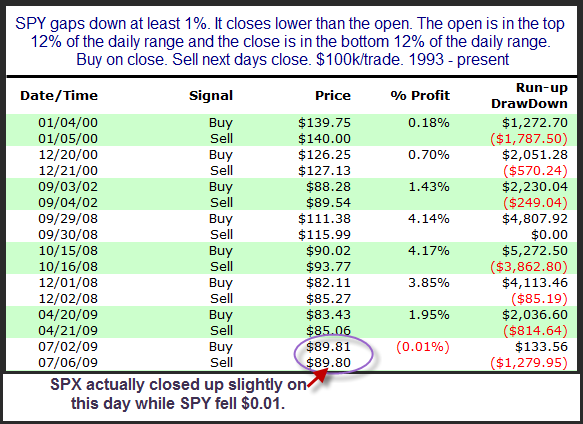 The SPY is about 0.9% below yesterday's close with 10 minutes to go until the open. 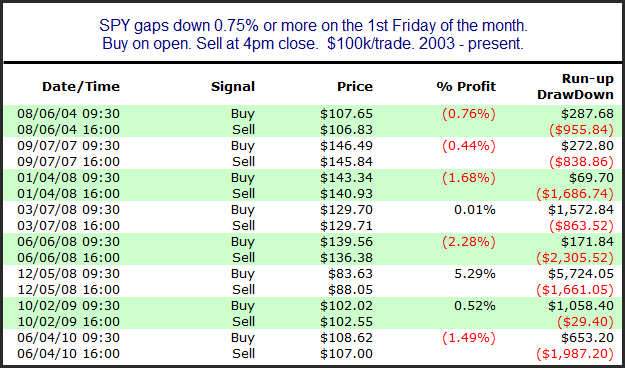 Below is a quick test that looks at other instances of large gaps lower on the 1st Friday of the month (typically the day of the jobs report). P.S. Tuesday is the next Fed Day...are you ready? Download the Quantifiable Edges Guide to Fed Days and understand where the edges lie. While the SPX was closing at a new short-term high yesterday the NYSE volume was coming in at the lowest level in over two weeks according to my data. Over the last several years this has not been a good combination - even when the market is in an uptrend. This is demonstrated in the study below.